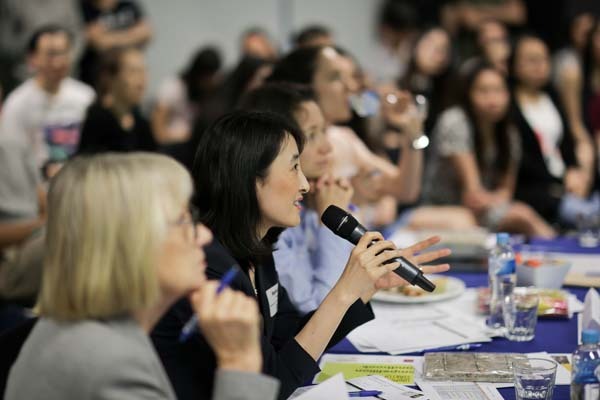 Water-cooler ideas can truly turn into reality, as has been the case for the winning team at this year’s UniMelb StartUp Pitch Competition. 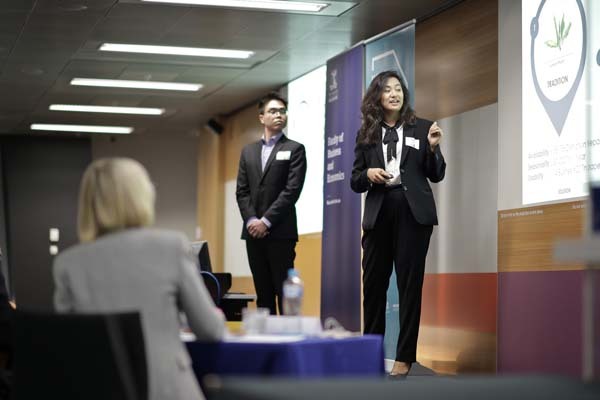 This year, the Faculty of Business and Economics delivered its ninth iteration of encouraging and supporting the University of Melbourne’s student community with bringing their start-up ideas to life. A total of 23 teams from across the University fought it out for a chance to win up to $6,000 in seed funding. 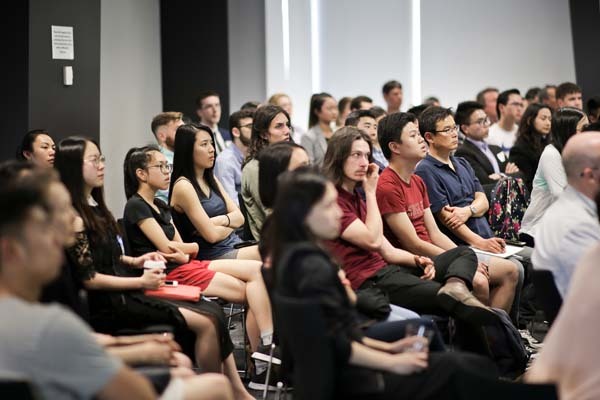 Thanks to financial support and backing from the Faculty of Business and Economics, Melbourne Business School, Wade Institute and the University’s Student Services and Amenities Fee Grant initiative, two teams were also given the opportunity to apply for an immersive Entrepreneurship Program in San Francisco. The program will take place in January of 2018 and includes a place in The Berkeley Method of Entrepreneurship Bootcamp, during which one lucky team will be spend one week with Aussie Startups in San Francisco to learn the ropes of how a start-up works. 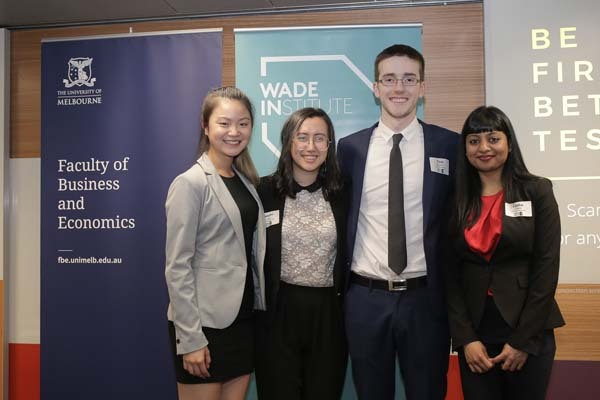 We spoke with Simone James, Lessi Liu, Tom Stawhorn and Lekha Vijayaraj from team ImmunoBuddy, who not only took first place in the finals, but were also selected to travel to San Francisco for the full entrepreneurship experience. Tell us about your startup idea – what is it and what is the expected impact? Lekha: We are developing a personalised, compact and portable food allergen sensor, Immunobuddy. This device detects specific allergens in real-time for individuals with food hypersensitivities. Food hypersensitivities are both food intolerances and allergies. Currently, people with food hypersensitivities often gamble with their health when they choose to dine out. With the convenience of ImmunoBuddy, our customers will enjoy peace of mind by being able to make informed decisions based on their specific food intolerances or allergies. ImmunoBuddy will also predict how intense a food intolerance reaction the user may have, through a dynamic feedback loop in which users can record their experiences through an accompanying smartphone app. For example, a person who suffers from gluten intolerance will be able to check if the gluten-free bread they have ordered in a restaurant is truly gluten-free and how bad their food-intolerant reaction will be if they choose to consume the bread. Immunobuddy will help Australians get to know their food better. What did you enjoy about the competition? Lekha: The competition was an excellent experience where we learned how to develop entrepreneurship skills. I loved connecting with such a talented and diverse group of like-minded students and participating in fun activities together during the mixer nights of the competition. Customer validation and product-market-fit workshops helped me understand that solving a problem is more important than great technology. These workshops were very informative, especially for a person like me, who is not originally from a commerce or business background. Although drafting a business proposal was a challenge, I enjoyed the process as the proposal provided a clearer vision for our product. Finally, the most enjoyable part of this competition was pitching our startup idea to judges. Initially, it was nerve-racking; however, with practice and the help of mentors, we were able to deliver our idea in a clear and concise way. Tell us about the challenges you experienced in developing this idea for the competition. Tom: Early on in the development progress, as a team we uncovered what we thought- a huge flaw in our business. We were unsure whether the unit cost to test food would be too high for the value provided to the market we were going to target. To overcome this, we spent a full day ideating other potential markets, and other value propositions for our product. After this, we then headed into Melbourne hotspots and conducted face-to-face interviews with anyone that would stop and talk to us. Additionally, we opened an online survey and targeted this to many allergy and intolerance groups. Through this process, we began to better understand our customers, and were now comfortable with our identified target market. Did you get any mentoring? Who from? What was this like? Tom and Simone: We secured many mentors. It was very helpful to get mentors in the many aspects of the business and pitch. Our mentors have continually offered us support and provided advice based on their expertise. At times when our group faced challenges and we didn’t know which direction to take, our mentors were able to provide clarity in moving towards the most efficient steps. This was especially important when working in a team environment where all of us have come from different backgrounds. Any top tips for preparing for the competition? Spending time around each other even when not working on the competition: this allowed us to bounce ideas off each other throughout the day. Don’t just rely on your internal sources – talk to people! What we found most effective was literally going out and talking to potential customers. Continually questioning ourselves from the perspective of our customers. Staying healthy, getting sleep and giving support to each other. Seek team members who are just as, if not more motivated, than you are. Working well in a team is essential. Use each other as a support, motivate and support each other. Always go back to your customers, and align your product or service to cater to their needs. Seek advice from experienced individuals: this helped us consider problems from different perspectives. Do you have any advice or top tips for future participants or budding entrepreneurs in general? Simone: Get involved in the enrichment programs the University has to offer. You never know where you’ll meet the most significant people in your life. Lekha: Definitely! Diversity drives innovation, so jump out of our own bubble once in a while, collaborate and try new projects that may seem to be out of your comfort zone. Tom: Over the next few months, we hope to achieve our three main deliverables for ImmunoBuddy: Prototype development, intellectual property rights and further market validation. This will be done with the help of our mentors here in Australia and the startup innovators, whom we will meet in San Francisco. We can’t wait!